Our little one is almost five months old and we’re getting into a daily routine that works with both our day jobs, the kids day care, the dog day care, my weekly bellydance classes, my husbands weekly classes and rehearsals, bellydance events and keeping the household running. No wonder I feel a bit worn out! Working on a costuming project or with my sewing machine is my way to unwind after a busy day. When the baby is asleep, the dog is dreaming underneath the coffee table and the laundry and dishes are done, I hop on the couch and chat with my husband or we watch a bit tv together while I sew. For a recent hafla I needed a purple dance bra but I didn’t have time to completely rework a badic bra, or buy supplies. Instead I bought a basic purple bra from an outlet I could visit duringg my lunch break. I kept all the straps and decided to add beads to make it more glamorous. I found a bit of leftover gold trim in my stash from one of the first costumes I made and stitched it to the top of the bra. 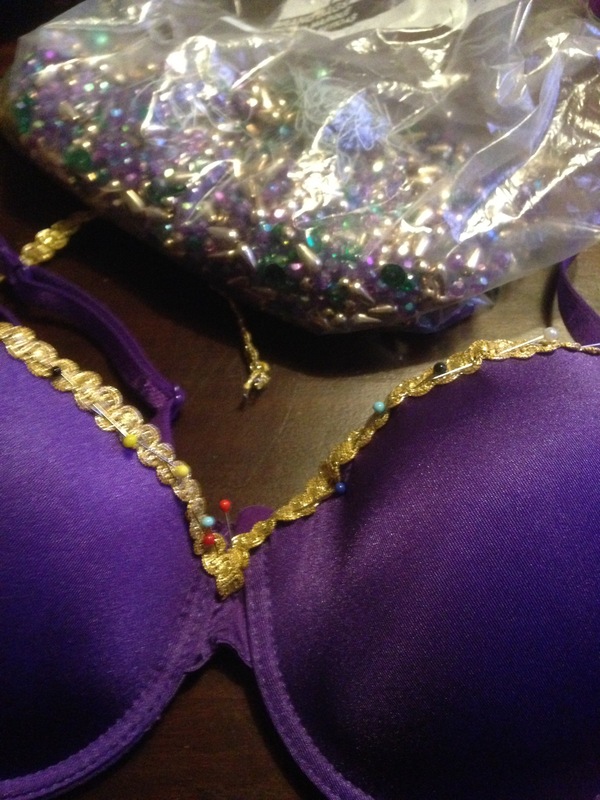 I unearthed a bag of gaudy plastic beads, left over from when I completely remade a Neckelman’s bra. I started adding beaded drapes to the bra, starting on the outside and slowly working towards the center of the bra. The whole thing took me about two hours, which meant it took me about three days to finish, right on time for the hafla. It worked well on stage and it is very comfortable to wear. I wouldn’t recommend it for professional performances and such, but as a quick bra for a student troupe performance it worked like a charm. What are your favorite quick diy projects? I am a professional bellydancer and costume-a-holic living in the Netherlands. I’ve been sewing and crafting stuff for over twenty years, for theaters, dance costumes, historic costumes and regular clothes. If you enjoyed this post and like to kept in the loop, please like Kyria Bellydance on Facebook or follow me on Twitter. Leave your questions or comments in the box below, or let me know through Facebook and I might write a blog post to answer your costuming question. The simple design is so elegant! Are there any pics of it with the rest of your outfit? I combined the bra with a purple hip scarf and a purple chiffon skirt and sleeves from my bellydance wardrobe. The photographer of the event is still working on the pictures so don’t have a picture of the full outfit yet.